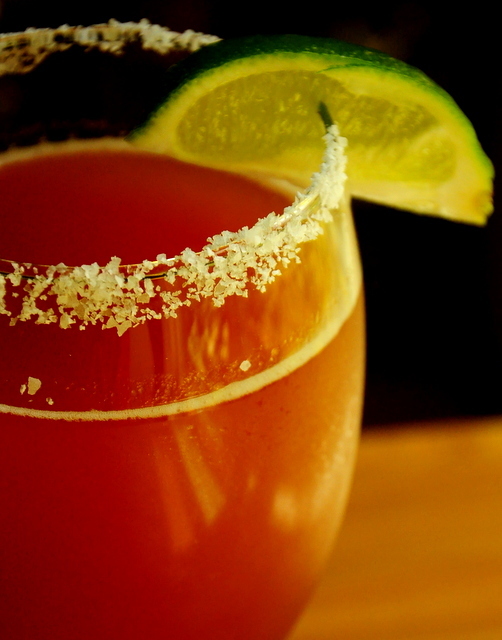 Many years ago, I was introduced to the Michelada by my friend, and fellow bartender, Rosendo. He named this drink after his home of Michoacan. Actually, he incorporated Michoacan in the name of every drink he made because he loved his hometown. He also loved all things spicy and made sure there was plenty of spice in his drinks. This was his version of the Michelada. Glassware: Any glass will do. Place chopped jalapeno pepper, salt, and tomato juice in a mixing glass and muddle until the pepper is pulverized. Add the Worcestershire, Tabasco, Lime juice, and an ounce of beer. Stir until well combined. Pour into a glass rimmed with salt. Add the rest of the beer and garnish with a lime wedge. Enjoy with a side of Jalapenos.